I spent last weekend with an old friend. Hanging out on the couch with me, he reminisced about old friends, bringing back a rush of memories--of wonderful meals and new ways to think about food. I wasn't actually with anyone. 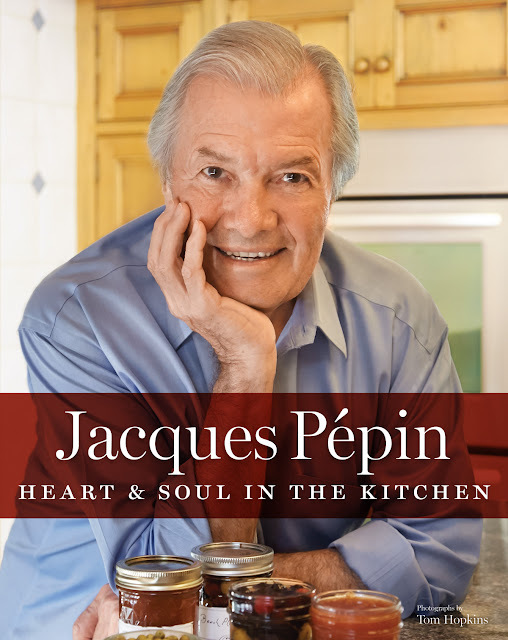 I was curled up with Jacques Pépin: Heart & Soul in the Kitchen (Houghton Mifflin Harcourt/$35). Like many of you, Pépin has been a part of my life for decades. I have several of his previous books, have watched his many PBS series over the years, and dined at L'Ecole, the restaurant of the International Culinary Center (formerly the French Culinary Institute) in lower Manhattan, where he has long been Dean of Special Programs. In a sense, he has long been the heart and soul of my culinary journey. So, here we are with this big, beautifully illustrated (by Pépin, who is also an artist) and lushly photographed book that he claims will be his last. As such, it is filled with the joy of 80 years of a life well lived--with his wife Gloria, his daughter Claudine and her husband, and granddaughter Shorey. Chapters bursting with recipes are interspersed with chatty little reminisces of his best friend Jean-Claude Szurdak, a renowned chef in his own right, his second home on the Mexican coast, travels with his mother, and, of course, meeting and working with his dear friends Julia Child, James Beard, Craig Claiborne, and Pierre Franey. 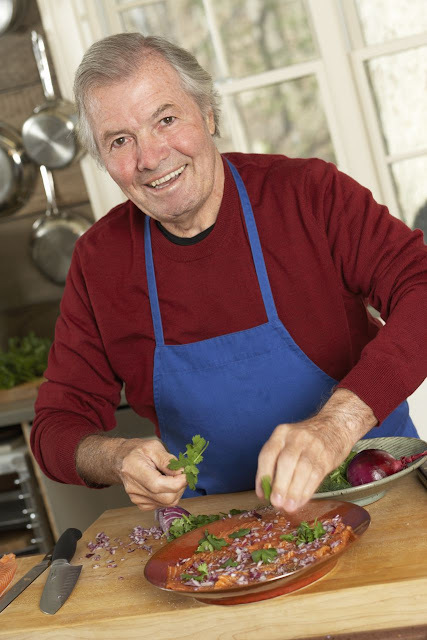 He explains how he develops recipes, what he keeps as pantry staples (canned beans, flour tortillas, frozen baby peas and artichoke hearts, assorted olives, and pepperoncini are just some), and, of course, the joys of cooking with young Shorey. Then there are the recipes. Now, remember, this book accompanies his new PBS series so if you tune in you'll get to watch Pépin in action--and see clips of times past. Last weekend's episode was a tribute to Julia Child so the recipes revolved around what he felt she would enjoy and there were clips of their times together on air that made me a little teary. The book, though, can stand alone on its own merit. And you'll certainly find yourself dipping into it to create what are essentially very accessible dishes based on quality ingredients that Pépin smartly lets shine without a lot of fuss. The book is divided into the usual chapters: Hors d'Oeuvres; Soups and Salads; Eggs, Cheese, and Bread; Poultry and Meat, etc. He also includes a chapter on organ meats, hoping to win doubters over. And, at the end, he's created menus out of the dishes. The dishes are often familiar--tabbouleh, omelets, broiled salmon with miso glaze, broiled maple sweet potatoes. Certainly there are a gazillion recipes for each of these that we could google, but what comfort in learning how Pépin creates them. And every once in awhile you'll get a nice surprise that inspires, like Pork Neck and Bean Stew, Stew of Radishes, or Escargot in Baked Potatoes. I'm looking forward to when the weather cools and I can dig into these recipes. You'll also have no trouble finding ingredients. Pépin has been at this long enough to feel comfortable taking appropriate shortcuts--hence using canned beans, pre-made pizza dough, Asian sauces off the shelf, V8 juice, and Tabasco or Sriracha sauce. But these are offset by local, seasonal produce and the best meats and seafood available. A simple dish can only succeed if the ingredients are sublime. I've picked a couple of recipes as teasers that would appeal particularly to SoCal readers. This Cannellini Bean Dip is no fuss and reminiscent of hummus--and enjoyable with good tortilla chips. In San Diego we're all about the peppers, so this Eggs in Pepper Boats immediately appealed to me. I even think Pépin would approve of a splash of Tabasco or Sriracha when served. I like to offer guests a little treat when I’m serving drinks, and this dip is always welcome. My pantry is never without canned beans, from cannellini to black beans to large butter beans. The garnishes make the dish look more attractive—and more like a classic hummus made with chickpeas. For the dip: Reserve 1/3 cup of the beans for garnish. Put the remaining beans in a blender or food processor. Add all the remaining ingredients and process until very smooth, scraping the bowl with a rubber spatula a few times if need be to help combine the ingredients. Transfer the dip (you should have about 2 cups) to a shallow serving dish and create a well in the center. For the garnishes: Put the reserved beans in the well in the dip and pour in the olive oil. Sprinkle with the paprika, poppy seeds, and parsley. Serve surrounded by the tostadas or tacos, toasts, or crackers. One day I decided to cook eggs in sweet peppers with a bit of cheese and cilantro. It made a great lunch dish. I used the long, pale green peppers sometimes called banana peppers. Poblano and cubanelle peppers also work, especially if you want to add a little heat. Split the peppers lengthwise in half and remove the seeds and the stems if you want. Arrange them cut side down in a large skillet and add the oil, water, and . teaspoon of the salt and cook, covered, over medium heat, turning occasionally, for about 4 minutes, or until the peppers are softened somewhat but still firm. Remove the skillet from the heat and, if necessary, turn the peppers over so they are hollow side up. Place the cheese in the peppers. Break an egg into each one and sprinkle the eggs with the remaining ¼ teaspoon salt and the pepper. Return the skillet to the stove, cover, and cook over medium heat for 3 to 4 minutes, until the egg whites are set but the yolks are still runny. Transfer to plates, sprinkle with the cilantro, and serve immediately.